This is the seventh representation of a natural system to be showcased in VC. You can read more about other exceptions here. 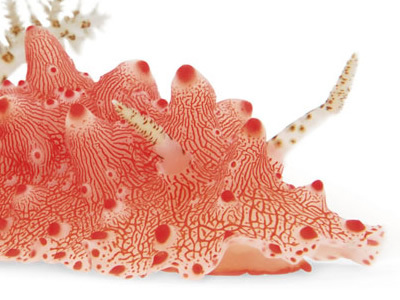 A nudibranch is a member of one suborder of soft-bodied, shell-less marine opisthobranch gastropod mollusks, which are noted for their often extraordinary colors and striking forms. 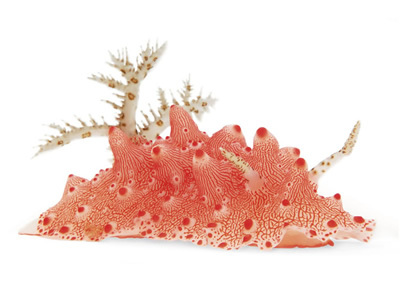 They are often casually called "sea slugs" and look like the most gorgeously colored underwater snails on earth. Their anatomy may resemble the texture and color of the surrounding plants, allowing them to camouflage. Others, as seen especially well on Chromodorids, have an intense and bright coloring, which warns that they are distasteful or poisonous. Shown here is a species of Nudibranchs called Halgerda batangas. A hard body and thick skin help it armor against predators. Any that persist learn that the sponge-eater also exudes a toxin. This photo is part of a large set by the famous underwater photographer David Doubilet for National Geographic. It's well worth viewing this short video in order to have a better insight into the dynamics of these stunning creatures and also get to know the process used by David Doubilet to photograph them in his underwater studio. You can also check two flickr sets   with outstanding images of nudibranchs. Thanks to notcot for the tip into this beautiful underwater world.